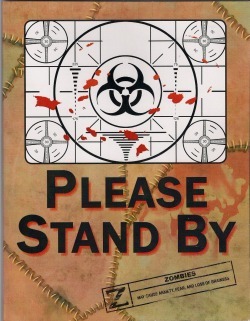 Please Stand By is a new zombie skirmish game from Battle Bunker Games, which is the same company responsible for Dice of the Dead (which I'll be covering in a separate review). The rulebook for Please Stand By is 50 pages, and is mostly a black and white affair, but the pages that can be photo-copied featuring tokens and templates for the game, are all in full color. The first couple of pages feature some fiction, to help set the mood. This little bit of fiction details the challenges faced by a small band of zombie survivors, held up in school cafeteria, as they battle it out with zeds. Rule-wise, the book is laid out and presented clearly, therefore learning the game in 30 minutes or less shouldn't be a problem for most gaming enthusiasts. The game itself requires some D6 dice, a measuring tape in inches, and 25mm models to represent zombies and survivors. They also say that it can support other scale models, but it's up to the players to do the modifying for any other scales. By design the game supports 2-7 players. One player plays a survivor character, the other a horde of zombies if only 2 players are involved. If others join in, they take on the role of additional survivors. A single player can also play more than one survivor character, if agreed upon ahead of time. Characters in the game are defined by seven stats. The stats on a character card are Strength, Toughness, Health, Attacks, Reaction, Movement and Initiative, and any gear that you're equipped with from the start would be listed as well. To attack simply roll 1D6 for every point of Attack value on your character profile. The Jock profile for instance, has 5 Attacks. So I am to roll 5 D6, and I will compare the result of the rolls to the Reaction value of the target I'm attempting to hit. This is the same To-Hit process for Range, trying to hit via Hand-2-Hand, or trying to smite a foe via a Melee weapon. It's that simple. Match or exceed the Reaction value and it's a hit. Ranged combat also has no limit on range. Strength is used to resolve Melee damage, by rolling 1D6 and adding the Strength value, and comparing the result to the Toughness of the character you're attacking. Matching or exceeding the Toughness results in a Wound. Hand-2-Hand and Melee both are resolved in this manner. Ranged Damage is conducted the same way, only instead of the Strength of the character, you simply use the Strength value of the ranged weapon to add to a single D6 roll, versus the Toughness of the target. Before applying a wound you're also allowed Saves, if you're dealing with Cover, or if the target is wearing armor. Different armor offer different armor values, but to roll for Damage Soak as they call it (armor save in any other game) you roll 1D6 and match or exceed the value of the Armor. Body Armor is a 3+, ChainMail is a 5+ and Plate Mail is at a 4+, but inhibits Movement and Reaction by -1 since it's so heavy. Cover Saves are also rolled at 4+. If you fail the saves, the character looses a point of health for every wound incurred. Once you're out of Health Points you're dead. Initiative is used to roll for Initiative before every round, which is 1D6 + Initiative value in a comparative roll off. Movement is 1 inch per point of movement on the character card. If you move within 1-inch of another opposing character you can also invoke an Attack of Opportunity, and these also occur when you try leaving base contact with a foe. A Run special rule also allows you to spend any, or all of you attack points to gain extra points of movement equal to the amount of attack points you sacrifice. There are some other neat little ways to spend some of your point values to increase your chances of success. For instance, the Jock carries a Baseball Bat, and his special rule is that he can spend 2, of his 5 Attacks, to include an additional D6 to the Damage roll. The general rule Called Shots allows any character performing a ranged attack to spend 2 attack points, to aim carefully for a head-shot. Called Shots only applies to a single attack, but if successful no matter how many health points the foe has left, this head-shot outright kills the opposing character. Line of Sight is quite simple too, if you can draw a line to any part of the model, you can target them, but cover saves may be applied depending on the situation. For instance, Characters and Zombies do not block LOS, but they would grant a cover save. If a character is ever found to be outnumbered 6-to-1 within 12-inches of zombies, they must make a Fear Factor test. This is done by rolling 2D6, and matching or exceeding the number of zombies. If you're outnumbered 6-to-1, you need to get a total of 6 on the two dice. If you're outnumbered by 8 zombies, you need to match or exceed 8 on 2D6. 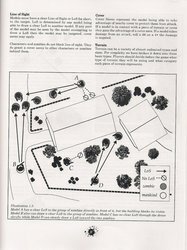 There's also rules for clear, impassible and difficult terrain, a result of 1 is always a failure, and a roll of 6 is always a success, and ammo is considered unlimited. You can also pickup the gear dropped by fallen characters. 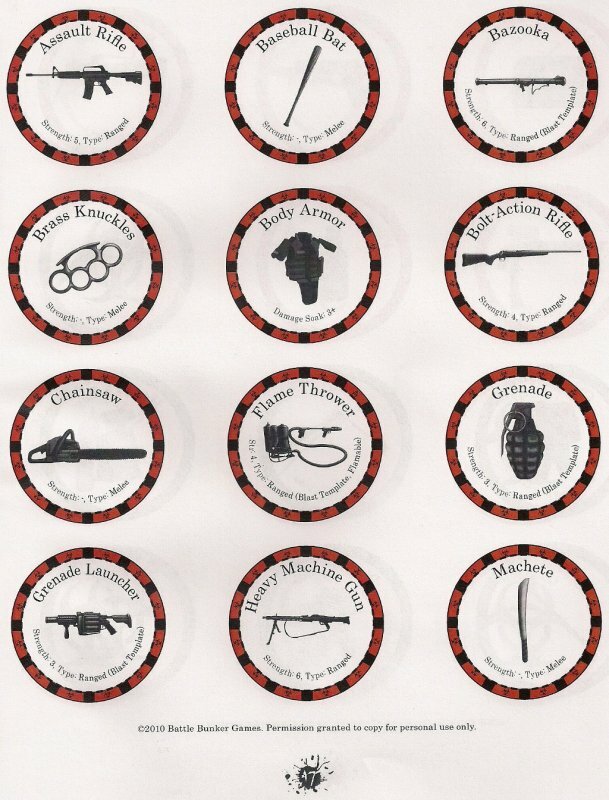 The tokens included in the back of the book detail the different weapons, armor, and bits of gear you will utilize in the game. These items can drop when you're killed, and the tokens are placed randomly via the scenario setup rules as well. When you're killed, your weapons/gear is dropped right where you died for others to pick up, and utilize. 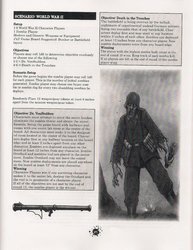 The weapons and gear include the armors I mentioned earlier, and assault rifle, bazooka, flame thrower, chainsaw, heavy machine gun, bolt action rifle, pistol, crossbow, bow, pitchfork, baseball bat, sword, flail, shotgun, Molotov cocktail, medkit and virus antidote vial just to name a few. There's flame and blast templates included as well for the grenade/bazooka, and flame thrower weapons. The antidote vial comes in handy when the zombie player decides to perform a Bite Attack, which is a special attack, and if successful the target can become infected. An infected player is given a marker for each round they stay infected, and if they end up with four infection markers, they are turned into a zombie. So the vial can be quite helpful. The sequence of play is simple too. After Initiative is decided, the player who won initiative goes first. After he has activated all of his models, it's the next character players turn, and so on down the line, based on order of initiative. The Zombie player always goes after all character players have went. Although in a two player game, Initiative isn't required, but this wasn't made clear via the rulebook. I spoke with Battle Bunker Games to clarify this, and I was told that this situation should be clarified in a an upcoming FAQ. To conclude a round, once a turn ends and everyone has went, for every character/survivor player left in the game you are to roll 1D6, and that's how many zombies are then spawned for the next round. 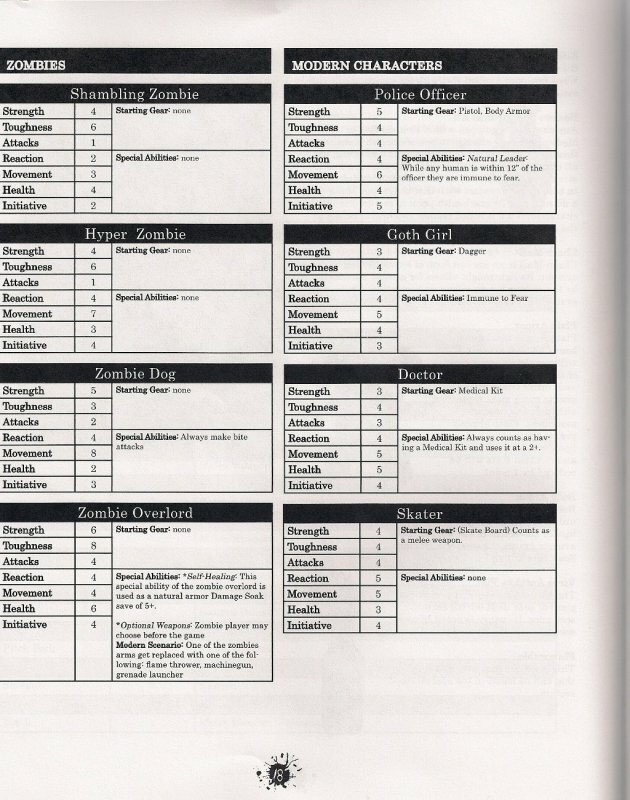 The rulebook includes 26 profiles, only four of which are zombies, technically three since one is Zombie dog. Although the dog is useful, it always uses the Bite special attack, and moves faster than any other character in the game with a movement value of 8. The other three are Shambling Zombie, Hyper Zombie and Zombie Overlord. 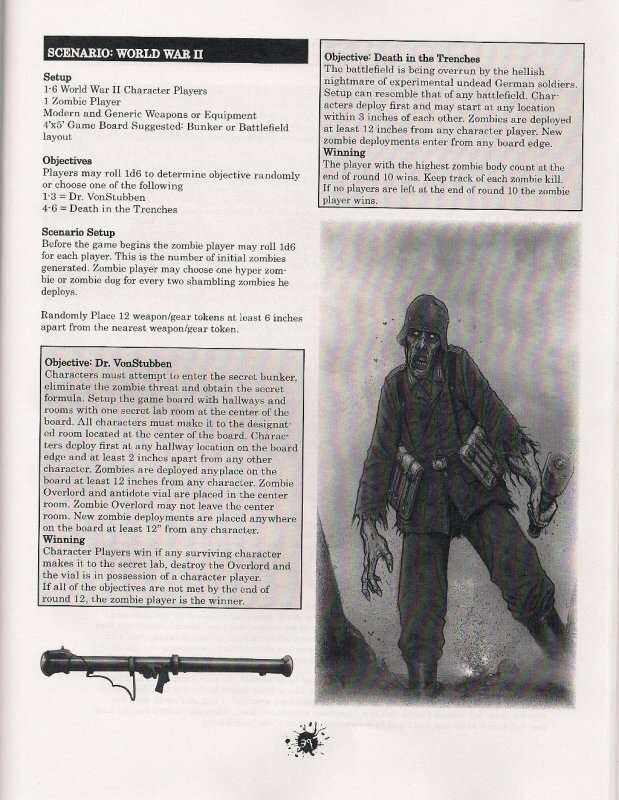 The Overlord is quite a nasty fella, he has the option to have an arm replaced with a flame thrower, machine gun or grenade launcher, plus has a save of 5+. The other zombies are run of the mill zeds, only the Hyper variant moves faster with a movement value of 7. The average movement value of characters in the game is 5-6. Only the Jock moves at 7 as well, and is the only character, other than the Zombie Dog that can keep up with the Hyper Zombie. The modern characters include a Cop, Goth Girl, Doctor, Skater, Computer Nerd and Jock. Ancient characters include Priest, Knight, Templar Knight, Monk and Peasant. 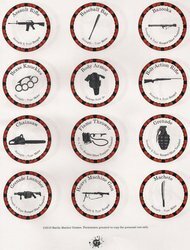 WWII characters include Sergeant, Medic, Rifleman, Grenadier and Machine Gunner. Lastly the Corporation characters include Assault Team Leader, Weapon Specialist, Close Combat Specialist, Mission Specialist and Scientist profiles. The scenarios are very well thought out, and I'm not one who's usually overly impressed by standard rulebook scenarios. Most of the seven scenarios feature a few pages of fiction setting the stage for each one, and they're all multiple objective scenarios, allowing you to play them out a few different ways. The first scenario is called Central Heights Mall. It calls for modern characters versus zombies, and a 4x4 playing surface, depicting in indoor shopping mall with four exits, one on each side of the board. Twelve weapon/gear tokens are to be placed at random throughout the map. The objective of this scenario can be rolled for, and the options are Escape the Mall, Survive Attack and Last Man Standing. You can simply agree upon which one you want to play as well. To escape survivors must make it to any of the four exits, and to leave a zombie cannot be within 3-inches of an exit, as the exit must be clear. The zombie player wins if any survivors are left in the mall on turn 8. It's that simple. For Survive Attack, the zombie player looses if any survivors are alive at the end of 10 rounds. Last Man Standing is quite clear, the last player alive at the end of 10 rounds wins, and that includes player survivors versus player survivors and zombies too. Which makes it pretty much free for all mode, if more than 2 players are involved. City Street Survival, Military Evacuation, Mega Corporation, WWII, Bring out Ye' Dead and Zombie Ville are the other scenarios provided. Mega Corporation reminds me of the first Resident Evil movie. The board is suggested to depict a Laboratory, Factory, Office building or Warehouse. Two objectives are offered Quarantine and Experiments. Quarantine tasks a Corporate Assault Team to contain the virus in a locked-down building. The zombies task is to escape the building. The assault team has to contain them. If a single zombie escapes before 8 rounds have passed, the zombie side then wins. If no zombies escape after 8 rounds, the assault team wins. Experiments utilizes the Zombie Overlord character, the secret lab in the middle of the board where he is held up, and he has possession of the secret formula. The assault team has to make it to the lab, kill the overlord, and take possession of the vial before the end of 12 rounds, otherwise the zombie side wins. The rules are even a little simpler than the Ganesha Games products I'm familiar with (like Fear and Faith), and light years easier to learn and play than All Things Zombie from Two Hour Wargames. Rules-wise I definitely like it. 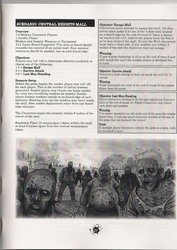 They cover all the ground necessary in terms of rules, to make for an easy to learn, and quick playing down and dirty skirmish game of zombie, and survivor killing action. Tacticians need not apply though, since this is really more of the “Beer and Pretzels” variety skirmish game, and less of a tactical affair. The rules take up literally 10 pages out of the 50 provided, so the learning curve is almost nonexistent. 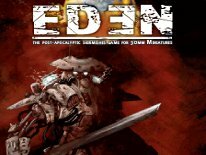 My only concern with the rules is, that some may actually think it's too simplified, because while they're easier to grasp and play than All Things Zombie, and even Fear and Faith, at the same time Please Stand By lacks the depth, more options and extended play value provided by those other products. I also have a couple of other concerns. The first is that there's no point cost for any of the characters or zombies provided, so trying to balance the forces for optimal gameplay outside of the scenarios will take a bit of trial and error. 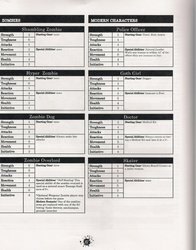 If the zombie player ends up with some strong rolls, the character/survivor player(s) can be outnumbered by quite a bit too. Usually this would be fine in most zombie games, as you expect to be outnumbered, and it makes for a more thrilling experience in most cases. The problem is, that the rules state you are to roll 1D6 after every round to see how many more zombies enter the game, and it also says you do this as long as the zombie deployment zones aren't full. 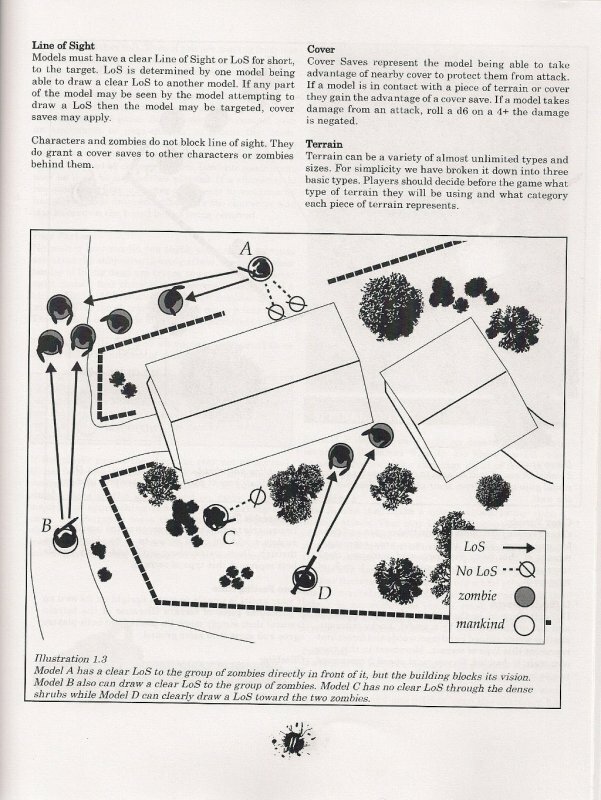 Nothing in the rules define a size, or boundaries for the deployment zones for the zombies. Therefore there's no way to determine if a deployment zone is filled, and zombies can keep spawning. In two player games, where the character/survivor player is running multiple characters, and in larger games with multiple characters, this can become a bit of a problem if the zombie player ends up with some lucky rolls. There's also no system in place to create more characters, so you're stuck with what's provided, and that's it. With only 26 profiles included, and only 4 for the zombie side, this game cries out for more character profiles. It's not like there's 26 different profiles you can use in any scenario either, because they're separated by eras with Modern, Ancient, WWII and Corporate categories, and there's only 4-5 profiles per category. Therefore Please Stand By feels more like a board game, which is made by design to be played out with just what is provided only. The rule-system isn't so complex that modifying it would be hard, but I for one don't like attempting to modify games without some guidelines, or point costs for character creation to go by to begin with. Please Stand By offers neither guidelines for character creation, or point costs. 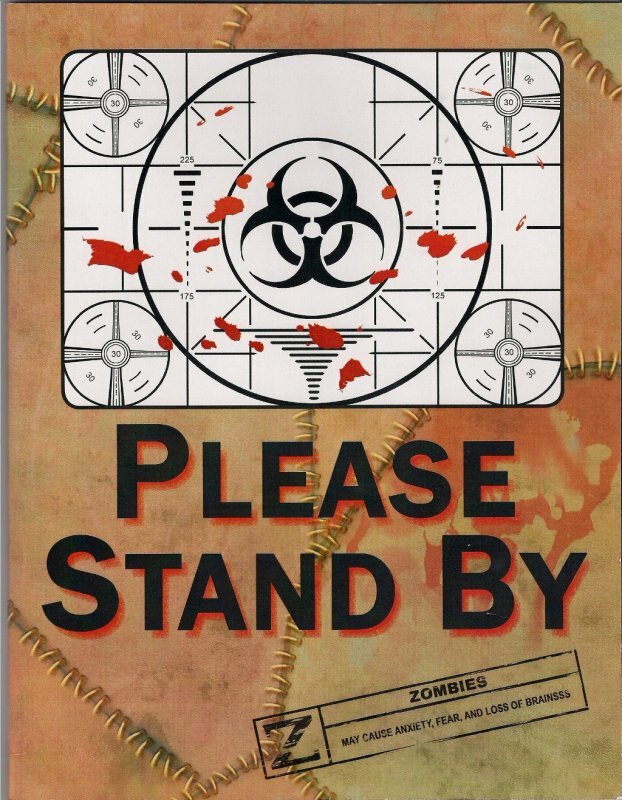 Now the scenarios is where Please Stand By really separates itself from the other zombie games I've seen, and it's clear they tried to do something unique with the scenario design. Almost every one has multiple objectives to choose from, so there's definitely some replay value there. The WWII scenario has a Castle Wolfenstein feel to it too. The mall one is clearly a Dawn of the Dead scenario, and the lighthearted Zombie Ville is a competitive achievement awarded scenario for multiple players, and feels like a spoof of the movie ZombieLand to me. They're all great fun. Here's the biggest deciding factor for most gamers, myself included. Please Stand By cost $25 direct from Battle Bunker Games. This is where I have the biggest problem with the game. When it comes to rulebooks, when you hit that $25+ mark, I feel it has to be something really special. When products like those from Ganesha Games never cost more than a $20 bill (or less), and they offer quite a bit more, and are almost equally a simple, it becomes really hard to swallow $25 for Please Stand By in comparison. Granted this is a printed rulebook, and a rather nice one at that, so I could see the asking price of maybe $15-$20 max, but I just think $25 it far too much for what Please Stand By has to offer. Please Stand By is fun, it's simple enough to play in a matter of minutes, and games don't usually last more than 30-45 minutes max, even with more than two players. There's also the fact, that it doesn't require a huge initial model investment, since you can use your own existing models. I thoroughly enjoyed the rules and scenarios, it's the price tag and lack of more characters to do more with it, which makes it hard for me to appreciate Please Stand By more.